This article is about the state of Chu during the Zhou dynasty. For other states of the same name, see Chu. Chu (Chinese: 楚, Hanyu Pinyin: Chǔguó, Old Chinese: *s-r̥aʔ) was a hegemonic, Zhou dynasty era state. From King Wu of Chu in the early 8th century BCE, the rulers of Chu declared themselves kings on an equal footing with the Zhou kings. Though initially inconsequential, removed to the south of the Zhou heartland and practising differing customs, Chu began a series of administrative reforms, becoming a successful expansionist state during the Spring and Autumn period. With its continued expansion Chu became a great Warring States period power, until it was overthrown by the Qin in 223 BCE. Also known as Jing (荆) and Jingchu (荆楚), Chu included most of the present-day provinces of Hubei and Hunan, along with parts of Chongqing, Guizhou, Henan, Anhui, Jiangxi, Jiangsu, Zhejiang, and Shanghai. For more than 400 years, the Chu capital Danyang was located at the junction of the Dan and Xi Rivers near present-day Xichuan County, Henan, but later moved to Ying. The ruling house of Chu originally bore the clan name Nai (嬭) and lineage name Yan (酓), but they are later written as Mi (芈) and Xiong (熊), respectively. According to legends recounted in Sima Qian's Records of the Grand Historian, the royal family of Chu descended from the Yellow Emperor and his grandson and successor Zhuanxu. Zhuanxu's great-grandson Wuhui (吳回) was put in charge of fire by Emperor Ku and given the title Zhurong. Wuhui's son Luzhong (陸終) had six sons, all born by Caesarian section. The youngest, Jilian, adopted the ancestral surname Mi. Jilian’s descendant Yuxiong was the teacher of King Wen of Zhou (r. 1099–1050 BCE). After the Zhou overthrew the Shang dynasty, King Cheng (r. 1042–1021 BCE) awarded Yuxiong's great-grandson Xiong Yi with the fiefdom of Chu and the hereditary title of 子 (zǐ, "viscount"). Xiong Yi built the first capital of Chu at Danyang (present-day Xichuan in Henan). In 977 BCE, during his campaign against Chu, King Zhao of Zhou's boat sank and he drowned in the Han River. After this death, Zhou ceased to expand to the south, allowing the southern tribes and Chu to cement their own autonomy much earlier than the states to the north. The Chu viscount Xiong Qu overthrew E in 863 BCE but subsequently made its capital Ezhou one of his capitals. In either 703 or 706, the ruler Xiong Tong proclaimed himself king, establishing Chu's full independence from the Zhou dynasty. In its early years, Chu was a successful expansionist and militaristic state that developed a reputation for coercing and absorbing its allies. Subsequently, Chu grew from a small state into a large kingdom. Under the reign of King Zhuang, Chu reached the height of its power and was considered one of the five Hegemons of the era. After a number of battles with neighboring states, sometime between 695 and 689 BCE, the Chu capital moved south-east from Danyang to Ying. Chu first consolidated its power by absorbing lesser states in its original area (modern Hubei), then it expanded into the north towards the North China Plain. In the summer of 648 BCE, the State of Huang was annexed by the state of Chu. The threat from Chu resulted in multiple northern alliances under the leadership of Jin. These alliances kept Chu in check, and the Chu kingdom lost their first major battle at the Chengpu in 632 BCE. During the 6th century BCE, Jin and Chu fought numerous battles over the hegemony of central plain. In 597 BCE, Jin was defeated by Chu in the battle of Bi, causing Jin's temporary inability to counter Chu's expansion. Chu strategically used the state of Zheng as its representative in the central plain area, through the means of intimidation and threats, Chu forced Zheng to ally with itself. On the other hand, Jin had to balance out Chu's influence by repeatedly allying with Lu, Wey, and Song. The tension between Chu and Jin did not loosen until the year of 579 BCE when a truce was signed between the two states. At the beginning of the sixth century BCE, Jin strengthened the state of Wu near the Yangtze delta to act as a counterweight against Chu. Wu defeated Qi and then invaded Chu in 506 BCE. Following the Battle of Boju, it occupied Chu's capital at Ying, forcing King Zhao to flee to his allies in Yun and "Sui". King Zhao eventually returned to Ying but, after another attack from Wu in 504 BCE, he temporarily moved the capital into the territory of the former state of Ruo. Chu began to strengthen Yue in modern Zhejiang to serve as allies against Wu. Yue was initially subjugated by King Fuchai of Wu until he released their king Goujian, who took revenge for his former captivity by crushing and completely annexing Wu. Freed from its difficulties with Wu, Chu annexed Chen in 479 BCE and overran Cai to the north in 447 BCE. This policy of expansion continued until the last generation before the fall to Qin (Lu was conquered by King Kaolie in 223 BCE). However, by the end of the 5th century BCE, the Chu government had become very corrupt and inefficient, with much of the state's treasury used primarily to pay for the royal entourage. Many officials had no meaningful task except taking money and Chu's army, while large, was of low quality. Bronze from the Tomb of Chu in Xichuan County. Chu's military formations are complete but cannot be maintained for long. The Chu people are soft and weak. Their lands stretch far and wide, and the government cannot effectively administer the expanse. Their troops are weary and although their formations are well-ordered, they do not have the resources to maintain their positions for long. To defeat them, we must strike swiftly, unexpectedly and retreat quickly before they can counter attack. This will create unease in their weary soldiers and reduce their fighting spirit. Thus, with persistence, their army can be defeated. During the late Warring States Period, Chu was increasingly pressured by Qin to its west, especially after Qin enacted and preserved the Legalistic reforms of Shang Yang. In 241 BCE, five of the seven major warring states - Chu, Zhao, Wei, Yan and Han - formed an alliance to fight the rising power of Qin. King Kaolie of Chu was named the leader of the alliance and Lord Chunshen the military commander. According to historian Yang Kuan, the Zhao general Pang Nuan (庞煖) was the actual commander in the battle. The allies attacked Qin at the strategic Hangu Pass but were defeated. King Kaolie blamed Lord Chunshen for the loss and began to mistrust him. Afterwards, Chu moved its capital east to Shouchun, farther away from the threat of Qin. Chu's size and power made it the key state in alliances against Qin. As Qin expanded into Chu's territory, Chu was forced to expand southwards and eastwards, absorbing local cultural influences along the way. By the late 4th century BCE, however, Chu's prominent status had fallen into decay. As a result of several invasions headed by Zhao and Qin, Chu was eventually subjugated by Qin. Bronze bells from the Tomb of Marquis Yi of Zeng, dated 433 BCE, State of Chu. According to the Records of the Warring States, a debate between the Diplomat strategist Zhang Yi and the Qin general Sima Cuo led to two conclusions concerning the unification of China. Zhang Yi argued in favor of conquering Han and seizing the Mandate of Heaven from the powerless Zhou king would be wise. Sima Cuo, however, considered that the primary difficulty was not legitimacy but the strength of Qin's opponents; he argued that "conquering Shu is conquering Chu" and, "once Chu is eliminated, the country will be united". The importance of Shu in the Sichuan Basin was its great agricultural output and its control over the upper reaches of the Yangtze River, leading directly into the Chu heartland. King Huiwen of Qin opted to support Sima Cuo. In 316 BCE, Qin invaded and conquered Shu and nearby Ba, expanding downriver in the following decades. In 278 BCE, the Qin general Bai Qi finally conquered Chu's capital at Ying. Following the fall of Ying, the Chu government moved to various locations in the east until settling in Shouchun in 241 BCE. After a massive two-year struggle, Bai Qi lured the main Zhao force of 400,000 men onto the field, surrounding them and forcing their surrender at Changping in 260 BCE. The Qin army massacred their prisoners, removing the last major obstacle to Qin dominance over the Chinese states. By 225 BCE, only four kingdoms remained: Qin, Chu, Yan, and Qi. Chu had recovered significantly enough to mount serious resistance. Despite its size, resources, and manpower, though, Chu's corrupt government worked against it. In 224 BCE, Ying Zheng called for a meeting with his subjects to discuss his plans for the invasion of Chu. Wang Jian said that the invasion force needed to be at least 600,000 strong, while Li Xin thought that less than 200,000 men would be sufficient. Ying Zheng sided with Li and ordered him and Meng Wu to lead the army against Chu; Wang Jian was forced to retire from state affairs upon a pretense of illness. The Qin armies scored initial victories as Li Xin's force conquered Pingyu (平輿, north of present-day Pingyu in Henan) and Meng Wu's captured Qinqiu (寢丘, present-day Linquan in Anhui). After conquering Yan (鄢, present-day Yanling in Henan), Li Xin led his army west to rendezvous with Meng at Chengfu (城父, east of present-day Baofeng in Henan). The Chu army, led by Xiang Yan, had avoided using its main force and waited for an opportunity to launch a counterattack. They secretly followed Li Xin's army for three days and three nights, before launching a surprise offensive and defeating the Qin army. Upon learning of Li's defeat, Ying Zheng visited the exiled Wang Jian in person and invited him back, putting Wang in command of the 600,000-strong army he had requested earlier and placing Meng Wu beneath him as a deputy. Worried that the Qin tyrant might fear the power he now possessed and order him executed upon some pretense, Wang Jian constantly sent messengers back to the king in order to remain in contact and reduce the king's suspicion. Wang Jian's army passed through southern Chen (陳; present-day Huaiyang in Henan) and made camp at Pingyu. The Chu armies under Xiang Yan used their full strength against the camp but failed. Wang Jian ordered his troops to defend their positions firmly but avoid advancing further into Chu territory. After failing to lure the Qin army into an attack, Xiang Yan ordered a retreat; Wang Jian seized this opportunity to launch a swift assault. The Qin forces pursued the retreating Chu forces to Qinan (蕲南; northwest of present-day Qichun in Hubei) and Xiang Yan was either killed in the action or committed suicide following his defeat. The next year, in 223 BCE, Qin launched another campaign and captured the Chu capital Shouchun. King Fuchu was captured and his state annexed. The following year, Wang Jian and Meng Wu led the Qin army against Wuyue around the mouth of the Yangtze, capturing the descendants of the royal family of Yue. These conquered territories became the Kuaiji Prefecture of the Qin Empire. At their peak, Chu and Qin together fielded over 1,000,000 troops, more than the massive Battle of Changping between Qin and Zhao 35 years before. The excavated personal letters of two regular Qin soldiers, Hei Fu (黑夫) and Jing (惊), tell of a protracted campaign in Huaiyang under Wang Jian. Both soldiers wrote letters requesting supplies of clothing and money from home to sustain the long waiting campaign. The Chu realm at its most powerful was vast with many ethnicities and various customs. Though diverse, the Chu people were united by a common respect for nature, the supernatural, and their heritage and loyalty to their ruling house and nobility, epitomized by the famed Chu statesman-poet Qu Yuan and the Songs of Chu. The Chu populace in areas conquered by Qin openly ignored the stringent Qin laws and governance, as recorded in the excavated bamboo slips of a Qin administrator in Hubei. Chu was one of the last states to fall and its people aspired to overthrowing the painful yoke of Qin rule and re-establishing a separate state. The attitude was immortalized in a Chinese expression about implacable hostility: "Though Chu have but three clans, Qin surely be perished by none other but Chu" (楚雖三戶, 亡秦必楚). After Ying Zheng declared himself the First Emperor (Shi Huangdi) and reigned briefly, the people of Chu and its former ruling house organized the first violent insurrections against the new Qin administration. They were especially resentful of the Qin corvee; folk poems record the mournful sadness of Chu families whose men worked in the frigid north to construct the Great Wall of China. The Dazexiang Uprising occurred in 209 BCE under the leadership of a Chu peasant, Chen Sheng, who proclaimed himself "King of Rising Chu" (Zhangchu). This uprising was crushed by the Qin army but it inspired a new wave of other rebellions. One of the leaders, Jing Ju of Chu, proclaimed himself the new king of Chu. Jing Ju was defeated by another rebel force under Xiang Liang. Xiang installed Xiong Xin, a scion of Chu's traditional royal family, on the throne of Chu under the regnal name King Huai II. In 206 BCE, after the fall of the Qin Empire, Xiang Yu, Xiang Liang's nephew, proclaimed himself the "Hegemon-King of Western Chu" and promoted King Huai II to "Emperor Yi". He subsequently had Yi assassinated. Xiang Yu then engaged with Liu Bang, another prominent anti-Qin rebel, in a long struggle for supremacy over the lands of the former Qin Empire, which became known as the Chu-Han Contention. The conflict ended in victory for Liu Bang: he proclaimed the Han Dynasty and was later honored with the temple name Gaozu, while Xiang Yu committed suicide in defeat. The Chu people and customs were major influences on the new era of the Han. Liu Bang immediately enacted a more traditional and less intrusive administration than the Qin before him, made peace with the Xiongnu through heqin intermarriages, rewarded his allies with large fiefdoms, and allowed the population to rest from centuries of warfare. By the time of Emperor Wu of Han, Chu folk culture and aesthetics were amalgamated with the Han-sponsored Confucian tradition and Qin-influenced central governance to create a distinct "Chinese" culture. Based on the archaeological finds, Chu's culture was initially quite similar to that of the other Zhou states of the Yellow River basin. Subsequently, however, Chu absorbed indigenous elements from the Baiyue lands the state conquered to its south and east, developing a distinct culture from the states of the northern plains. Early Chu burial offerings consisted primarily of bronze vessels in the Zhou style. Later Chu burials, especially during the Warring States, featured distinct burial objects, such as colorful lacquerware, iron, and silk, accompanied by a reduction in bronze vessel offerings. A common Chu motif was the vivid depiction of wildlife, mystical animals, and natural imagery, such as snakes, dragons, phoenixes, tigers, and free-flowing clouds and serpent-like beings. Some archaeologists speculate that Chu may have had cultural connections to the vanished Shang dynasty, since many motifs used by Chu appeared earlier at Shang sites such as serpent-tailed gods. Later Chu culture was known for its affinity for shamans. The Chu culture and government strongly supported Taoism and native shamanism supplemented with some Confucian glosses on Zhou ritual. Chu people affiliated themselves with the god of fire Zhurong in Chinese mythology. For this reason, fire worshiping and red coloring were practiced by Chu people. The naturalistic and flowing art, the Songs of Chu, historical records, excavated bamboo documents such as the Guodian slips, and other artifacts reveal heavy Taoist and native folk influence in Chu culture. The disposition to a spiritual, often pleasurable and decadent lifestyle, and the confidence in the size of the Chu realm led to the inefficiency and eventual destruction of the Chu state by the ruthless Legalist state of Qin. Even though the Qin realm lacked the vast natural resources and waterways of Chu, the Qin government maximized its output under the efficient minister Shang Yang, installing a meritocracy focused solely on agricultural and military might. Chu was known for its distinct music. 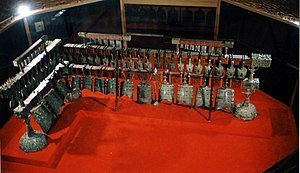 Archaeological evidence shows that Chu music was annotated differently from Zhou. Chu music also showed an inclination for using different performance ensembles, as well as unique instruments. In Chu, the se was preferred over the zither, while both instruments were equally preferred in the northern Zhou states. Chu came into frequent contact with other peoples in the south, most notably the Ba, Yue, and the Baiyue. Numerous burials and burial objects in the Ba and Yue styles have been discovered throughout the territory of Chu, co-existing with Chu-style burials and burial objects. The early rulers of the Han dynasty romanticized the culture of Chu, sparking a renewed interest in Chu cultural elements such as the Songs of Chu. Evidence of heavy Chu cultural influence appears at Mawangdui. After the Han dynasty, some Confucian scholars considered Chu culture with distaste, criticizing the "lewd" music and shamanistic rituals associated with Chu culture. Chu artisanship shows a mastery of form and color, especially the lacquer woodworks. Red and black pigmented lacquer were most used. Silk-weaving also attained a high level of craftsmanship, creating lightweight robes with flowing designs. These examples (as at Mawangdui) were preserved in waterlogged tombs where the lacquer did not peel off over time and in tombs sealed with coal or white clay. Chu used the complex calligraphic script called "Birds and Worms" style, which was borrowed by the Wu and Yue states. It has an intricate design that embellishes the characters with motifs of animals, snakes, birds, and insects. This is another representation of the Chu reverence of the natural world and its liveliness. Chu produced broad bronze swords that were similar to Wuyue swords but not as intricate. Chu was in the region of many rivers, so it created an efficient riverine transport system of boats augmented by wagons. These are detailed in bronze tallies with gold inlay regarding trade along the river systems connecting with those of the Chu capital at Ying. In 2000, a cache of Chu Warring States period funerary artifacts dating to 340-300 BCE was discovered in eastern Wulipu's Zuozhong village during the construction of the Xiang-Jing Highway (襄荆高速公路). Due to the Chu's absorption of indigenous elements from the Baiyue lands that it conquered in the south, substrate influences from Hmong–Mien, Kra-Dai or Austroasiatic have been proposed on the basis of epigraphic materials from the three centuries before the destruction of Chu. Chu's bureaucracy was distinct from other Zhou dynasty states. According to Li Tiaoyuan's "Zuozhuan Guanming Kao", Mo'ao (莫敖) and Lingyin were the top government officials of Chu. Sima was the military commander of Chu's army. Lingyin, Mo'ao and Sima were the San Gong (三公) of Chu. In the Spring and Autumn period, Zuoyin (左尹) and Youyin (右尹) were added as the undersecretaries of Lingyin. Likewise, Sima(司馬) was assisted by Zuosima (左司馬) and Yousima (右司馬) respectively. Mo'ao's status was gradually lowered while Lingyin and Sima became more powerful posts in the Chu court. Ministers whose functions vary according to their titles were called Yin(尹). For example: Lingyin (Prime minister), Gongyin (Minister of works), and Zhenyin were all suffixed by the word "Yin". Shenyin (沈尹) was the minister of religious duties or the high priest of Chu, multiple entries in Zuo Zhuan indicated their role as oracles. Other Yins recorded by history were: Yuyin, Lianyin, Jiaoyin, Gongjiyin, Lingyin, Huanlie Zhi Yin (Commander of Palace guards) and Yueyin( Minister of Music). In counties and commanderies, Gong(公), also known as Xianyin (minister of county) was the chief administrator. In many cases, positions in Chu's bureaucracy were hereditarily held by members of a cadet branch of Chu's royal house; Mi. Mo'ao, one of the three chancellors of Chu, was exclusively chosen from Qu (屈) clan. During the early spring and autumn period and before the Ruo'ao rebellion, Lingyin was a position held by Ruo'aos, namely Dou (鬭) and Cheng (成). Chu's expanse was one of the largest among ancient Chinese states. Progenitors of Chu such as viscount Xiong Yi were said to originate from Jing mountains; a chain of mountains located in today's Hubei province. Rulers of Chu systematically migrated states annexed by Chu to the Jing mountains in order to control them more efficiently. East of Jing mountains are the Tu (塗) mountains. In the north east part of Chu are the Dabie mountains; the drainage divide of Huai river and Yangtse river. The first capital of Chu, Dangyang (丹陽) was located in today's Zhijiang, Hubei province. Ying(郢), one of the later capitals of Chu, is known by its contemporary name Jingzhou. In Chu's northern border lies the Fangcheng mountain. Strategically, Fangcheng is an ideal denfense against states of central plain. Due to its strategic value, numerous castles were built on the Fangcheng mountain. Yunmeng Ze in Jianghan Plain was an immense fresh water lake that historically existed in Chu's realm, It was crossed by Yanzi river, the northern Yunmeng was named Meng (夢), the southern Yunmeng was known as Yun (雲). The lake's body covers parts of today's Zhijiang, Jianli, Shishou, Macheng, Huanggang, and Anlu. Shaoxi Pass was an important outpost in the mountainous western border of Chu. It was located in today's Wuguan town of Danfeng County, Shaanxi. 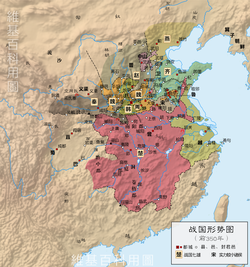 Any forces that marches from the west, mainly from Qin, to Chu's realm would have to pass Shaoxi. Xiong Kang (熊康), son of Xiong Qu. Shiji says Xiong Kang died early without ascending the throne, but the Tsinghua Bamboo Slips recorded him as the successor of Xiong Qu. King Wu of Chu (楚武王) (Xiong Da 熊達), ruled 740–690 BCE: either younger brother or younger son of Fenmao, murdered son of Fenmao and usurped the throne. Declared himself first king of Chu. King Zhuang of Chu (楚莊王) (Xiong Lü 熊侶) ruled 613–591 BCE: son of King Mu. Defeated the State of Jin at the Battle of Bi, and was recognized as a Hegemon. King Gong of Chu (楚共王) (Xiong Shen 熊審) ruled 590–560 BCE: son of King Zhuang. Defeated by Jin at the Battle of Chengpu. Jia'ao (郟敖) (Xiong Yuan 熊員) ruled 544–541 BCE: son of King Kang, murdered by his uncle, the future King Ling. King Ling of Chu (楚靈王) (Xiong Wei 熊圍, changed to Xiong Qian 熊虔) ruled 540–529 BCE: uncle of Jia'ao and younger brother of King Kang, overthrown by his younger brothers and committed suicide. Zi'ao (訾敖) (Xiong Bi 熊比) ruled 529 BCE (less than 20 days): younger brother of King Ling, committed suicide. King Ping of Chu (楚平王) (Xiong Qiji 熊弃疾, changed to Xiong Ju 熊居) ruled 528–516 BCE: younger brother of Zi'ao, tricked Zi'ao into committing suicide. King Zhao of Chu (楚昭王) (Xiong Zhen 熊珍) ruled 515–489 BCE: son of King Ping. The State of Wu captured the capital Ying and he fled to the State of Sui. King Hui of Chu (楚惠王) (Xiong Zhang 熊章) ruled 488–432 BCE: son of King Zhao. He conquered the states of Cai and Chen. The year before he died, Marquis Yi of Zeng died, so he made a commemorative bell and attended the Marquis's funeral at Suizhou. King Dao of Chu (楚悼王) (Xiong Yi 熊疑) ruled 401–381 BCE: son of King Sheng. He made Wu Qi chancellor and reformed the Chu government and army. King Xuan of Chu (楚宣王) (Xiong Liangfu 熊良夫) ruled 369–340 BCE: brother of King Su. Defeated and annexed the Zuo state around 348 BCE. King Wei of Chu (楚威王) (Xiong Shang 熊商) ruled 339–329 BCE: son of King Xuan. Defeated and partitioned the Yue state with Qi state. King Qingxiang of Chu (楚頃襄王) (Xiong Heng 熊橫) ruled 298–263 BCE: son of King Huai. 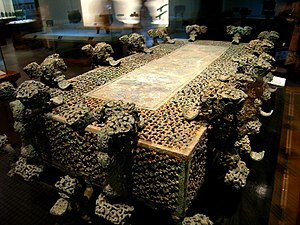 As a prince, one of his elderly tutors was buried at the site of the Guodian Chu Slips in Hubei. The Chu capital of Ying was captured and sacked by Qin. King Kaolie of Chu (楚考烈王) (Xiong Yuan 熊元) ruled 262–238 BCE: son of King Qingxiang. Moved capital to Shouchun. King You of Chu (楚幽王) (Xiong Han 熊悍) ruled 237–228 BCE: son of King Kaolie. In traditional Chinese astronomy, Chu is represented by a star in the "Twelve States" asterism, part of the "Girl" lunar mansion in the "Black Turtle" symbol. Opinions differ, however, as to whether that star is Phi or 24 Capricorni. It is also represented by the star Epsilon Ophiuchi in the "Right Wall" asterism in the "Heavenly Market" enclosure. The virus taxa Chuviridae and Jingchuvirales are named in honor of Chǔ. ^ "楚都丹阳". Archived from the original on 2011-07-07. ^ Baxter & Sagart (2014), p. 332. ^ "河南库区发掘工作圆满结束，出土文物已通过验收". 合肥晚报. 2011-01-25. Archived from the original on 2011-07-11. ^ "关于黄帝和楚国的姓氏问题". zgxiong.com. Archived from the original on 21 March 2012. Retrieved 23 October 2015. ^ a b c Sima Qian. "楚世家 (House of Chu)". Records of the Grand Historian (in Chinese). Archived from the original on 10 March 2012. Retrieved 3 December 2011. ^ "Yu Ding: Evidence of the Extermination of the State of E during the Western Zhou Dynasty (禹鼎：西周灭鄂国的见证)" (in Chinese). Archived from the original on 4 August 2012. Retrieved 23 October 2010. ^ "5.僖公 BOOK V. DUKE XI". The Institute for Advanced Technology in the Humanities (in Chinese). Translated by James Legge (with modifications from Andrew Miller). The Institute for Advanced Technology in the Humanities. Retrieved 28 March 2018. from Zuo zhuan, twelfth year of Duke Xi of Lu《左傳·僖公十二年》: "黃人恃諸侯之睦于齊也，不共楚職，曰，自郢及我，九百里，焉能害我。夏，楚滅黃。 'The people of Huang, relying on the friendship of the States with Qi, did not render the tribute which was due from them to Chu, saying "From Ying [the capital of Chu] to us is 900 li; what harm can Chu do to us?" This summer, Chu extinguished Huang." ^ a b c d e Gu, Donggao (1993). 春秋大事表. Zhonghua Book Company. pp. 940–945, 972, 1140, 2055–2066. ISBN 9787101012187. ^ Sources differ on the exact date. ^ "The Warring States" (in Chinese). Retrieved 4 October 2010. ^ Traditionally taken to be the Qu (屈), Jing (景), and Zhao (昭). ^ Sima Qian. Records of the Grand Historian, "Biography of Xiang Yu" (項羽本紀). ^ Lin, Qingzhang (2008). 中國學術思想研究輯刊: 二編, Volume 6. p. 176. ISBN 9789866528071. ^ Behr 2009, pp. 1-48. ^ Chamberlain 2016, p. 67. ^ 中國早期國家性質. Zhishufang Press. 2003. p. 372. ISBN 9789867938176. ^ Song, Zhiying (2012). 《左传》研究文献辑刊（全二十二册）. Beijing: National Library of China publishing house. ISBN 9787501346158. ^ Tian, Chengfang (Autumn 2008). "從新出文字材料論楚沈尹氏之族屬源流". Jianbo(简帛) – via 简帛网. ^ Hong, Gang (2012). 财政史研究. 中国财政经济出版社. ^ See also, the Tsinghua Bamboo Slips. ^ a b Ziju (子居). 清华简《楚居》解析 (in Chinese). jianbo.org. Archived from the original on 2 December 2013. Retrieved 10 April 2012. ^ Note: Shiji calls him Xiong Zhihong (熊摯紅), and says his younger Xiong Yan killed him and usurped the throne. However, Zuo Zhuan and Guoyu both say that Xiong Zhi abdicated due to illness and was succeeded by brother Xiong Yan. Shiji also says he was the younger brother of Xiong Kang, but historians generally agree that he was the son of Xiong Kang. ^ Allen, Richard. "Star Names – Their Lore and Meaning: Capricornus". ^ "Richard Hinckley Allen: Star Names – Their Lore and Meaning: Ophiuchus". penelope.uchicago.edu. Retrieved 23 October 2015. ^ Wolf, Yuri; Krupovic, Mart; Zhang, Yong Zhen; Maes, Piet; Dolja, Valerian; Koonin, Eugene V.; Kuhn, Jens H. "Megataxonomy of negative-sense RNA viruses" (docx). International Committee on Taxonomy of Viruses (ICTV). Retrieved 12 January 2019. Sima, Qian. Records of the Grand Historian (史記). Behr, Wolfgang (2017). "The language of the bronze inscriptions". In Shaughnessy, Edward L. (ed.). Kinship: Studies of Recently Discovered Bronze Inscritpions from Ancient China. The Chinese University Press of Hong Kong. pp. 9–32. ISBN 978-9-629-96639-3. Behr, Wolfgang (2009). "Dialects, diachrony, diglossia or all three? Tomb text glimpses into the language(s) of Chǔ". TTW-3, Zürich, 26.-29.VI.2009, "Genius Loci": 1–48. Chamberlain, James R. (2016). "Kra-Dai and the Proto-History of South China and Vietnam". Journal of the Siam Society. 104: 27–77. Miyake, Marc. 2018. Chu and Kra-Dai.